After spending a month away from a food challenge, we’re coming back to the kitchen this month. This month’s challenge was my original idea for a 2018 intention…that quickly grew to a year long plan for lessening my environment impact! Make sure to subscribe to be notified when each monthly challenge is announced! Anyway, one day I was in the kitchen, loading up some food in plastic sandwich bags. Out of nowhere, I felt terrible. How much plastic was I using? And of course using = throwing away. Plastics are both a miracle and a huge environmental burden. I’m fortunate enough to be able to easily afford reusable food storage containers, so there’s no reason for me to be wasting SO. MUCH. PLASTIC. This month, join me in cutting out unnecessary plastic waste, by using reusable food storage whenever possible! Plastics make modern life comfortable and convenient. And while it’s easy to toss a baggie after one use, plastics don’t biodegrade – they photodegrade. This essentially means that they break down into smaller parts that when small enough can be consumed by tiny organisms. However the photodegradation process can take 50 – 1000 years, depending on environmental conditions. In addition to their durability, plastics are considered pretty disposable. Around half of all plastics are one time use. After that almost all of them (>95%) end up in places like landfills, or worse, water sources. Plastics that enter fresh water lakes and rivers as well as the ocean can settle on the bottom and photodegrade at the slowest rate, killing millions of birds and sea animals each year. We can make a difference in these statistics by reducing our food storage waste! Frankly, there isn’t a ton of information on sandwich bag pollution out there, but there is a lot about plastics in general and plastic bags (including shopping bags) as a whole. On average, a family will throw away about 540 sandwich bags in a year. Since this challenge is for a month (ok, maybe we’ll just do this forever, but I’m going to do calculations for a month), that’s about 45 baggies in a month. That adds up to about $2.70 per month. Hooray, financial savings. If you were to drive your car five miles in a month, that would equal about the same about of environmental waste equivalent as tossing those bags. And as noted above, aquatic plants and animals will thank you for reducing water pollution. I don’t know about you, but I have a perpetually infuriatingly disorganized cabinet of reusable food storage containers. These are my favorites. Each and every time I want to reach for a plastic baggie, if it’s possible (and I really can’t think of any reason it wouldn’t be), I’ll store my food in one of these instead. Can’t afford to buy new food storage? Try checking out resale shops, or dollar stores. I have purchased some great food storage containers at Dollar Tree in the past. A free food storage option, and a way to reduce even more plastic waste is to reuse empty food containers! Simply wash out any resealable food container like a yogurt or ice cream tub and reuse to keep another food fresh. If you do end up using some plastic baggies, recycle them. There are certain rules about recycling plastic film; you can read about those here. Or reuse your sandwich bags at home by wiping or rinsing clean (using as little water as necessary). 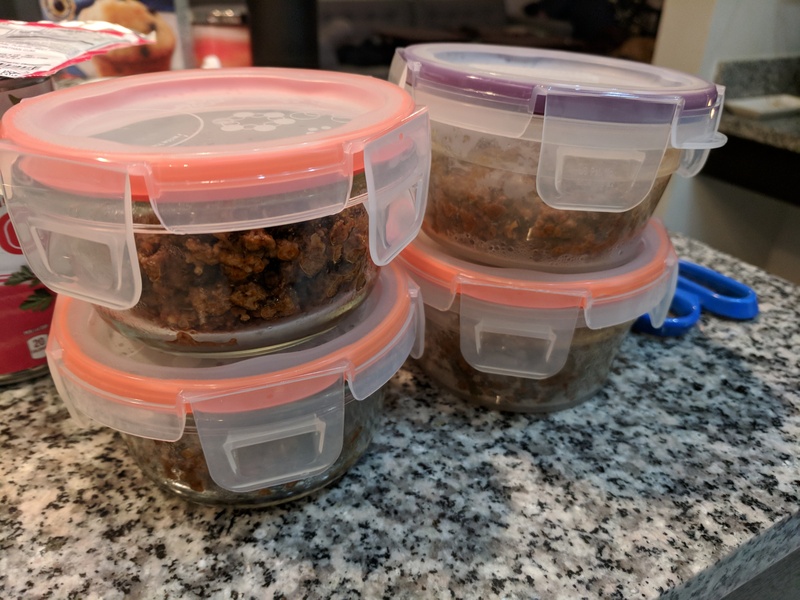 Take your own reusable food container to take home leftovers from meals out (or, reduce the frequency of eating out altogether). Good luck on this month’s challenge! I’d love to know how the year of reduced impact is going for you – leave me a comment! As always, I’ll be updating Pinterest, Instagram, Facebook and Twitter with tips and accountability this month. And make sure to subscribe to make sure you hear first and can plan for April’s challenge! YES! I love this. And I love the idea of a monthly challenge. Definitely signing up! I feel like a month is a good amount of time to establish a new habit, then build on that the next month and the next month. Loved your plastics post and glad to have you along! !